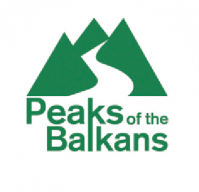 This is a relatively long hike which crosses the border between Montenegro and Albania. The path passes along the craggiest part of the Prokletje/Bjeshkёt e Namuna/Alpet Shqipёtare mountains. Almost the entire hike is surrounded by steep mountains with stunning views. This itinerary allows us a glance into the region’s past when it was a forbidden zone during the Communist era. A border military post, a bunker and the border crossing pyramid sign still remain by the crossing. The transfer hike finishes at the beautiful village of Theth with its traditional tower houses surrounded by steep mountains. If you would like to divide this hike into two parts (two days), the best place to stay overnight is the meadow at Sheh i Bardh (WP 6i) where you can set up your tent. There might also be shepherds during the summer time at the former border police building from whom you can buy fresh food. This place is located almost in the middle of the trail. The hike starts at Vusanje (WP 4h) and follows southwest along a dirt road. After approx. 300 meters, we find a wonderful waterfall flowing out of the Grlja river (WP 1i). Our hike continues along the dirt road and after approx. 1.4 kilometers we take a right turn, continuing over a narrow foot path for about 50 meters, until we arrive at another area attraction – the “blue eye”. The blue eye is a small lake whose rich groundwater sources grant it the bluish color of its water (WP 2i). From the blue eye, we turn back to the dirt road and follow it southwest. After approx. 2 kilometers we reach a nice meadow (WP 3i). Travelers can also reach this point by 4WD. Our route gently ascends southwest along a path, which can be easily followed, lined by steep mountains. After approx. 2 kilometers of following the valley southwest, we will reach a lake (Lićeni Gšfars) which might be dried up during the summer time. We follow the path southwest and after approx. 500 meters we reach the Albanian border where a pyramid (WP 4i) from Communist times reminds you that you have entered a border area. The Albanian motif and the letters “RPSSH” are written on the pyramid. RPSSH is an acronym for the “People’s Socialist Republic of Albania” (Republika Popullore Socialiste e Shqipёrisё). From the border, we continue ascending southwest, first through an oak forest, and then through a pine forest, for approx. 1.4 kilometers until we reach a very nice meadow (Fusha e Ruinicёs). This is an inviting spot to rest awhile. At Fusha e Ruinicёs a water source is located close to the shepherds’ summer huts (WP 5i). The route continues along a visible path south over flat terrain which gently begins to ascend through the valley. After approx. 1.5 kilometers, we reach a bunker followed by a water source (WP 6i) approx. 100 meters further on. The abandoned building close to the water source used to be a military building protecting the border. There is also a nice meadow here (She i Bardhё), a good option for camping if you are not planning to go directly to Theth. From She i Bardhё, the route follows the gentle ascent south along a visible path. We start to descend for several meters as we approach Lake Pejёs (Albanian: Liqeni i Pejёs or Liqeni i Peshkeqes) at WP 7i. 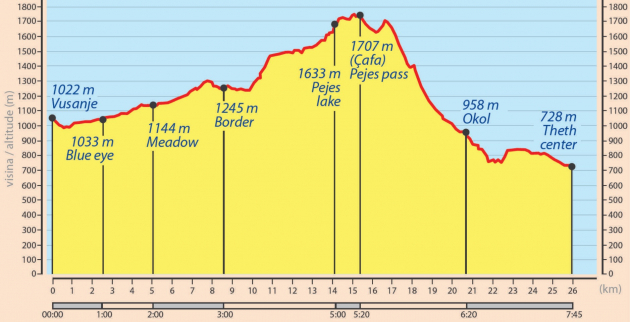 From the lake, we start an ascent south and reach the Pejёs pass (Qafa e Pejёs) after approx. 400 meters. Qafa e Pejёs (WP 8i) offers a stunning view towards Theth valley. Our descent from the pass zigzags south along a very steep, but well-maintained and safe path. This takes us to Theth valley. As the descent becomes gentler, the visible track passes through a wooded area of pines. After approx. 1.3 kilometers through the forest, we reach a water source (WP 9i). The source itself is located approx. 700 meters before Okol village in Theth valley. From Okol we follow a dirt road southeast over flat terrain bordering the Thethi River, reaching Theth village (WP 10i) approx. 3.8 kilometers later. In both Okol and Theth, village guesthouses can be found. Theth is also a good option for spending one or two days to visit the surrounding attractions (e.g. blue eye, waterfall, blood tower, ethnographic museum, etc. ).